A recent review of our grocery bills revealed a truth we already knew: we spend about as much on groceries as your average family of eight. As I am always up for challenge I recently accepted the task of slashing our grocery budget in half. This has not actually been as hard as I had anticipated. Our natural inclination is to sample a wide variety of foods both to suit my natural tendency to never want to cook the same thing twice and Jen's intense hatred of leftovers. Being creative on a largely unchecked budget is one thing, doing so on half that budget is another thing all together. Another side-effect of this shift in spending would not only help us to more easily save some money but also to save some calories as we probably consume more food than we need to. 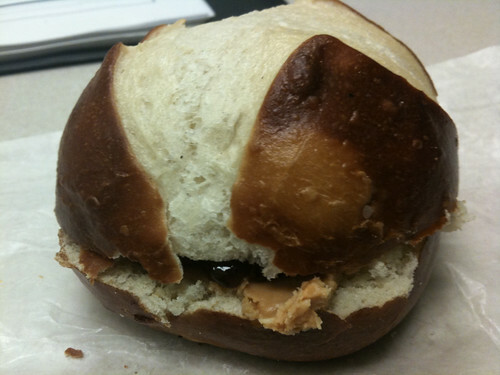 Last week, before leaving work, I made myself a peanut butter and jelly sandwich on a pretzel roll. I took advantage of this opportunity to post a picture of the sandwich to Facebook just before leaving work. After all, what point is there in eating food at all if you don't post or tweet about it? Also, this helps fuel the commonly held belief by Twitter and Facebook haters that these services are only used for the purposes of alerting your friends when you are having a sandwich. By the time I got off the highway I noticed that crowds had gathered. They were waving, cheering, and throwing confetti. Some of the people were running out into the street alongside my car. As I drove around the block a few times I realized they were following me! I turned down my radio and rolled down my windows only to hear the muted cheers clarify. Bits of confetti fell through my open sunroof and a woman even asked me to sign her baby. While I'm quite popular in the New York area this was a little out of the ordinary, even for me. When I finally beat back the throngs of admiring fans and entered my apartment I logged onto Facebook and saw that my peanut butter and jelly sandwich on pretzel roll was being heralded as the greatest culinary achievement since Escoffier's publication of Le Guide Culinaire. Everything I'd done, everything I'd made prior to this was inconsequential. My true genius, apparently, was in putting peanut butter and jelly onto a different type of bread than I normally do. Since I'm nobody's fool I decided to ride this wave into dinner the following night. 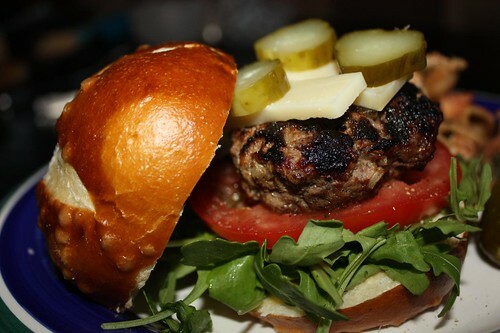 I purchased some more pretzel rolls (that's right, I didn't even make the pretzel roll, I just bought it) along with some other ingredients to craft a burger on the bread that had earned me so much fame. I put a generous dollop of SweetSmoothHot Mustard from SchoolHouse Kitchen (my new favorite mustard) along with some arugula, sliced tomato, sliced Gruyere, and dill pickle slices. On the side: leftover pasta salad from a few nights ago, and potato chips. Jen and I have conflicting ideas of how burgers should be cooked. I believe burgers should be made from ground beef which is barely mixed together, just formed loosely into a patty and all seasoning should go on the outside of the burger. For me those seasonings are simply salt and Paul Prudhomme's Meat Magic. Jen, on the other hand, believes that burgers should be mixed up with chopped onion, Worchestershire sauce, seasonings, and mustard powder. My good friend Paul, also Canadian, has the same belief so I assume this is just a Canadian custom. After further research it is apparently customary to pay for these burgers using beaver pelts. Jen and I both enjoy our own burger methods more than the other's but not hugely. I think we both share a 60/40 preference for our own method which means we just alternate between methods. Since we made burgers using my method most recently it was her turn. Unfortunately I forgot the dry mustard element but for the most part I remained true to her country's technique. Tonight I pulled everything out of the fridge that we've accumulated since our return from Maine, scratched my chin thoughtfully, then put this together. 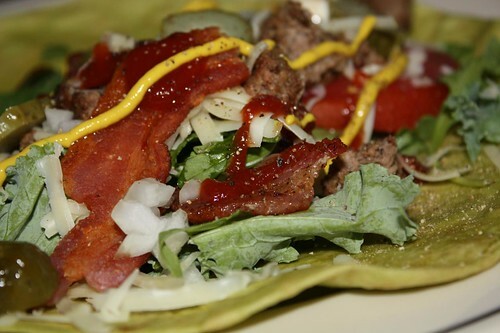 I call it the 'Sloppy Cheeseburger Wrap' and it consists of crumbled burger, kale, arugula, chopped white onion, tomato, bacon, ketchup, mustard, mayonnaise, shredded cheddar, and pickles. What I made was part genius, part abomination, part thing you would find on the menu of a terrible American restaurant that has a name with an unreferenced possessive like Cheetah's or Sarsaparilla's or Armadillo's. The surprising thing is that the blueberries we purchased in Maine (twelve days ago, mind you) are still in the fridge. More remarkably they are still in good shape. However, I felt the need to get rid of the remainder so I turned them into blueberry ice cream, inspired by an ice cream I observed in a Maine ice cream shop. After making an extremely lousy strawberry ice cream last month I felt the need for a redemption ice cream. This ice cream was far better than its strawberry cousin though I would opt to put a little less sugar in next time. Today was a rest day on the Tour de France which means we got to take a break from sitting in a stuffy room and watching men in spandex to sit in a stuffy room and watch awkward vampire romance as we caught up on True Blood. 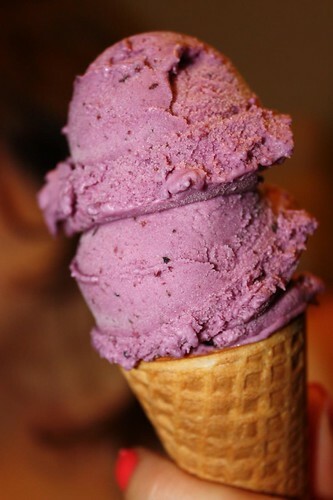 Blueberry ice cream never tasted so good.